Amy Hawkins, a young dot-com executive from California who has made her fortune at the top of NASDAQ, sets off for Europe to find culture, her roots, and maybe a cause to devote her considerable fortune to. Amy starts her quest at one of the finest small hotels in the French Alps--a hotel noted for skiing and its famous cooking lessons--in the town of Valmeri, amid an assortment of Euro trash aristocrats and ski enthusiasts. She has no plans to fall in love. On the first afternoon, she is nearly swept away by an avalanche . . .
With a memorable cast of characters assembled on an unmistakably European stage, Diane Johnson has crafted a penetrating comedy of manners about being American in Europe--and about love. Not the most entertaining work. I didn't feel connected to the characters so I felt a bit bored even by their outlandish antics. I thought this audiobook was wonderful. The author did a great job keeping my interest and the reader did a wonderful job playing the many character roles. Although it didn't end exactly how I wanted it to, I thought it was a wonderful "listen." 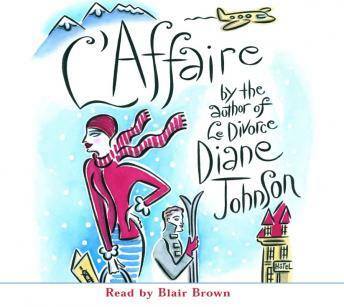 I chose this selection because I like to hear Blair Brown read. It turned out to be quite an entertaining story. Ms. Brown jumped from American English to the Queen's English to French accented English effortlessly.